Set your Caller ID with KeepCalling smartphone app! One of the best things about KeepCalling.com is that you automatically get free calling credit just by using our services. Of course, you can always get even more free credit by simply recommending our services. Sounds good? Then keep reading (and watching) to find out how to make free international calls with KeepCalling.com! Our Thank You points program! 1. By using KeepCalling.com – That’s right! You don’t have to make any effort, just use our services to call, receive calls or send a top up anywhere in the world. For any order you place on our website you receive 2% of its value in Thank You points. So whether you prefer Voice Credit, Monthly Plans, Virtual Number, or a casual Mobile Recharge, we add Thank You points to your account whenever you make a purchase. Could it be any easier? 2. 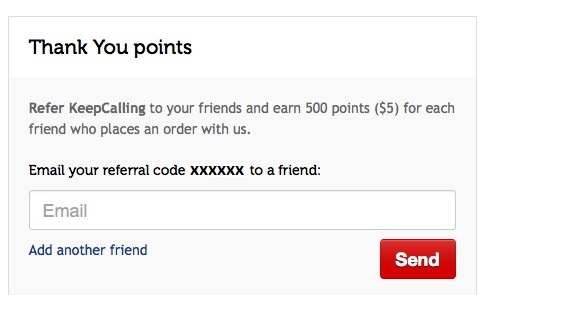 By referring a friend – Get 500 Thank You points without spending any money! Send your referral code to a friend and tell him how much you enjoy KeepCalling.com! When they open an account on our website and place their first order, we give them 500 Thank You points as a sign of appreciation. You can find your referral code in your account information section and you can email it to everyone at the push of a button! Convert your points to free Voice Credit! When your Thank You points count reaches 1000, you can convert them into $10 Voice Credit that you can use to make call calls or send SMS anywhere in the world. Free is always a good idea, so Thank You for using KeppCalling.com!